Beatrice Matiash surrounds a gold-plated penny with fellow fortunate friends. Your best friend/sister/daughter/favorite teen is getting one of these cheerful necklaces from you? Lucky! 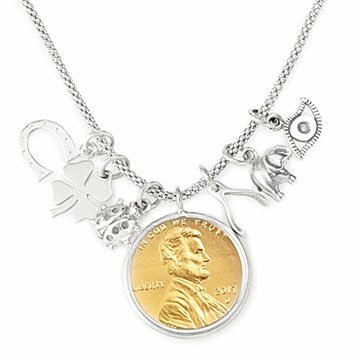 With a gold-plated penny surrounded by a sterling silver four-leaf clover, ladybug, horseshoe, elephant, wishbone, and eye to ward off evil spirits (a total of, yep, seven), they're sure to feel fortunate. Especially for having someone so thoughtful—and stylish—in their life. Handmade by Beatrice Matiash in New Jersey. Designer Beatrice Matiash is motivated by unconventional sources of inspiration. "I am in part a collector," she said. "Everywhere I go, I feel drawn to the color combination on anything from a flyer to a tea set, and to the history of things like a twig or a penny. I collect all these things that influence my jewelry designs." She fondly recalls collecting pennies as a child and immediately checking the year so she could dream up a story about the owner who dropped it. In the spring of 2000, Beatrice launched Tashka by Beatrice with a small collection sold in local neighborhood boutiques. Her offerings now include five jewelry groups available nationwide. Penny: .7" Diameter, Charms: .5", Chain: 18"